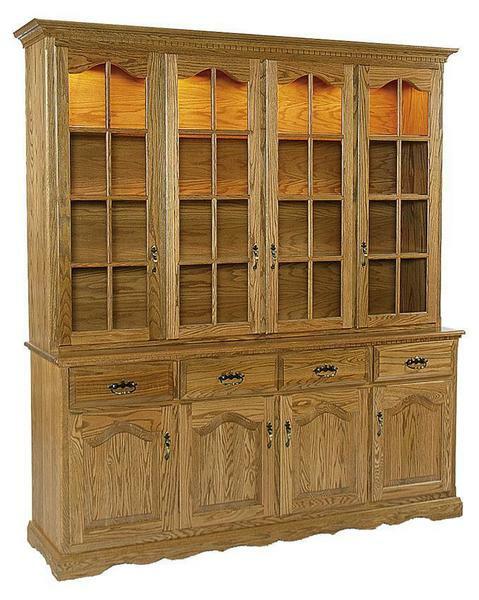 Amish Full Four Door Hutch - 74"
If you've collected a large quantity of special dishes and crystal or you're looking for a way to house a collection of books in style, the grand Amish Full Four Door Hutch-74" is a solid wood showcase for the job. Amish furniture available with custom options to best fit your decor, this wood hutch offers the most space for storage and display. Four gorgeous cabinets line the top of this hutch, supported by four drawers and four lower cabinets. There's room for utensils, special serving spoons, serving pieces and anything else you'd like to store. This hutch is completely customizable with several base options to pick from with each style handcrafted by skilled Amish craftsmen. You can add interior lighting if you wish, along with hardware and the most important part--the wood type. You've found a custom made solid wood hutch for all time. This gorgeous storage case will perform for decades. It comes with the look and features that will serve you best. Select options online or if you'd like more personal service, please email or call an Amish Furniture Specialist. We are eager to answer any questions you have about our Amish furniture. And don't forget some of our special offers like 30% down payment plans on qualified orders.